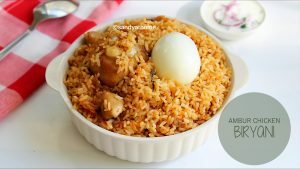 Ambur chicken biryani is one such delicious and lip smacking one pot meal that has its own distinct flavors and cooking method where taste is overloaded due to slight variation in the ingredient list which makes it stand out among other biryani. 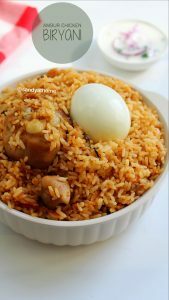 This biryani is so flavorful and delicious due to the seeraga samba rice (short grain rice) and red chilli paste. I tried to prepare this ambur biryani in an authentic way to retain the best of its flavors. 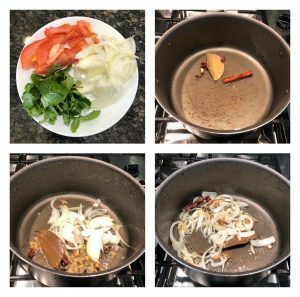 I got this recipe from my hubby ‘s friend recently as they make excellent ambur biryani as they their hometown is ambur which is a good news for us. 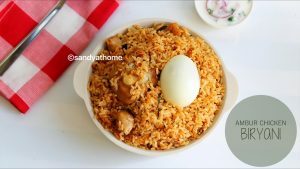 This version biryani tastes more close to the original version than the ambur biryani recipe I posted earlier. This ambur biryani tastes great with brinjal curry and raita. 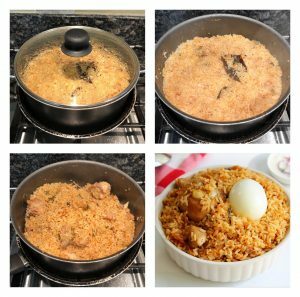 So try making this distinct taste of biryani in your kitchen and let me know your feedback. So let’s get to the making! 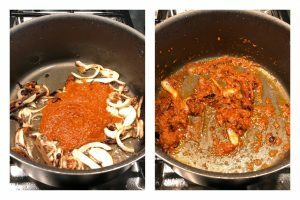 In a bowl add dried red chilli, to it add warm enough to immerse the chilli. Allow it to soak for 20 minutes. After 20 minutes in a blender add the red chilli and grind it into fine paste and keep it aside. Slice onions thin, chop mint, cilantro and tomato finely. Wash, clean and chop chicken breast into big chunks. Wash rice and keep it aside. Heat water in a pot add salt. When the water is rolling boil add the washed seerage samba rice and allow it to cook till half done. Heat oil in a heavy bottomed vessel ,add the whole spices when aromatic add the ginger garlic paste. Saute well till the raw smell goes. Do not saute for long time as it will taste bitter. Now add sliced onions and saute well in medium flame. Now add the ground chilli paste. Saute well till raw flavors go. Now add chopped mint and cilantro. Saute well till they shrink in size. Now add the chicken pieces and mix well till the chicken pieces coats well in the masala. Now add the tomatoes slices and salt. Saute well. Now add curd and mix well. Add 2 cups of water and mix well. Allow the chicken to cook. When the chicken ¾ th done with thick gravy add lemon juice snd mix well. Now add half done rice without any water. Mix well and cover it with a lid. Place the heavy bottom vessel on a tawa and cook on high flame for 5 minutes and another 15 minutes in low flame. When done take rice gently from the sides using spatula and serve it hot with raita or brinjal curry! 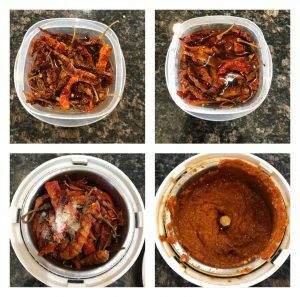 In a bowl add dried red chilli, to it add warm enough to immerse the chilli. Allow it to soak for 20 minutes. After 20 minutes in a blender add the red chilli and grind it into fine paste and keep it aside. Slice onions thin, chop mint, cilantro and tomato finely. Wash seeraga samba rice and soak it in water for 15 minutes. Heat oil in a heavy bottomed vessel ,add the whole spices when aromatic add the ginger garlic paste. Saute well till the raw smell goes. Do not saute for long time as it will taste bitter. Now add sliced onions and saute well in medium flame. Now add the ground chilli paste. Saute well till raw flavors go. Now add chopped mint and cilantro. Saute well till they shrink in size. 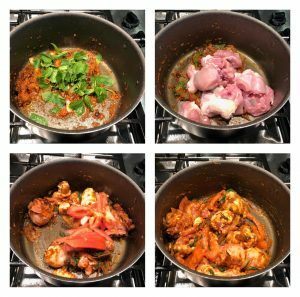 Now add the chicken pieces and mix well till the chicken pieces coats well in the masala. Now add the tomatoes slices and salt. Saute well. Now add curd and mix well. Add 2 cups of water and mix well. Allow the chicken to cook. 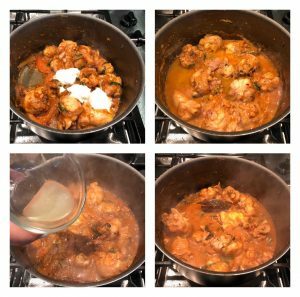 When the chicken ¾ th done with thick gravy add lemon juice and mix well. Meanwhile when the chicken is get cooked heat water in a pot add salt. 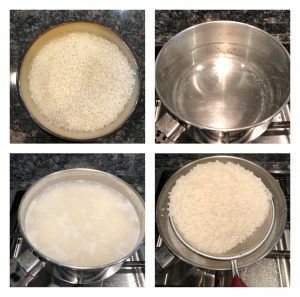 When the water is rolling boil add the washed and soaked seerage samba rice and allow it to cook till half done. Now add half done rice without any water. Mix well and cover it with a lid. Place the heavy bottom vessel on a tawa and cook on high flame for 5 minutes and another 15 minutes in low flame. When done take rice gently from the sides using spatula and serve it hot with raita or brinjal curry!